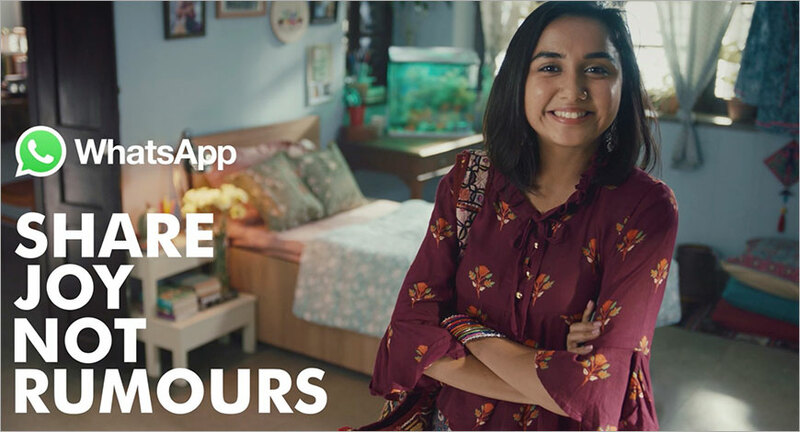 WhatsApp India has launched its first ever TV campaign called “Share Joy, Not Rumours” as the latest step in a comprehensive effort to address the challenge of misinformation and pernicious rumors. WhatsApp worked closely with the Mumbai agency Taproot Dentsu and the filmmaker Shirsha Guha Thakurta to develop three sixty second films that each convey real scenarios about rumours that have spread on WhatsApp via spam as well as in family and school groups. Each film's protagonist teaches someone important in their lives to not spread rumours and to use WhatsApp controls such as the ability to block senders and leave groups where rumours are spread. Commenting on the campaign, Director Shirsha Guha Thaktura of Oink Films said, “WhatsApp has become an integral part of society in India - it's how I stay in touch with my family and run our film production house. So this project was special for us at various levels. We of course made a WhatsApp group for the project in the name of 'WhatsApp on WhatsApp'. But WhatsApp is also being misused and can be a source of rumors and it is something that affects us all the time. We created these three films to help address the challenges we face in communicating online." WhatsApp conducted extensive research with users in India and based each film on a real user's experience. The three films will be available on TV, Facebook, and YouTube in ten languages to reach the diverse population that makes up WhatsApp users. The TV campaign is timed to start just prior to the elections in Rajasthan and Telangana, and WhatsApp will build on this effort headed into the national election next year. “We're humbled by the impact that WhatsApp had on people's ability to freely connect with their loved ones. We recognize at the same time connecting people can also lead to the spread of misinformation, which has to be confronted. We hope this campaign will help educate people how to stay safe on WhatsApp,” added Bosco Zubiaga, who led production of these films for WhatsApp. Over the last several months, WhatsApp has made a series of changes including placing a label on forwarded messages to inform users when they have received something not from their immediate contact and a limit on how forwarded messages can be sent. In addition, WhatsApp continues to build on anti-spam detection capabilities to ban accounts that engage in unwanted automated activity. Kavya moved to Delhi and it's her first time living away from home, so she uses WhatsApp to stay in touch with her family. When her uncle shares fake news with her family, Kavya calls to explains he can leave the group where the rumour came from. Rajat is a leader in his University and runs a WhatsApp group for his class. When he receives a shocking message from a classmate, he talks it over with the sender and asks him to think twice before sharing rumors again. Geetha is a foodie who uses WhatsApp to stay up to date with local businesses and send recipes to her friend. One day she receives a rumour from an unknown contact so she talks it over with her mom and chooses to block the user that sent the message.